Ref comment yesterday about the WU showing some precip Friday. Hope discussion below explains. 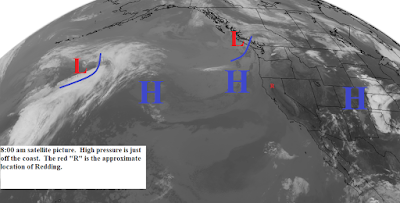 High pressure is along the west coast. Today will be mostly sunny with temperatures slightly cooler than yesterday. The high pressure system is moving slowly westward as a "cutoff" or closed low pressure area forms over the Nevada. The low will be in place by the weekend (see map below) and since it is cutoff from the jetstream will wobble around over Nevada through early next week. Thursday we will continue mostly sunny with cooler temperatures and light wind. Friday there will be a some cumulus along and east of the Sierra Cascade Crest. Saturday through Tuesday there will be afternoon and evening thunderstorms over Siskiyou, Modoc, Lassen, eastern Plumas, and eastern Nevada counties. The rest of the north state will be partly to mostly sunny. Temperatures will continue to cool and by the weekend they will be slightly below normal. Gusty north winds will occur in some areas Saturday and Sunday. As I noted before, forecasting the movement of these closed lows is hard since they are cutoff from the main flow. It looks now like this low will wobble around Nevada Saturday through Tuesday. After that it should begin to slowly moved northeastward....although one model run takes it westward over Northern California...stay tuned..